The North West Europe Campaign of 1944-1945, fought by the British Second Army and First Canadian Army as elements of the British 21st Army Group. The campaign started with the landings in Normandy and ended on May 4th, 1945 with Field Marshal Bernard Montgomery taking the German military surrender of all German forces in Holland, north west Germany and Denmark on Luneburg Heath, (situated between the cities of Hamburg, Hanover and Bremen). As with the first campaign the British Commonwealth forces were on the northern flank of the Western Front. The Twelfth United States Army Group, was to their immediate south, further south still was the Sixth United States Army Group, (that was also known as the Southern Group of Armies as the French First Army was a constituent part). Our Price: $16.99 Sold Out! Early in 1943, orders were given to design a heavy, self-propelled anti-tank gun, which would mate a 12.8cm gun with a Tiger II chassis. On October 20th, 1943 a wooden mock-up of the enormous vehicle was shown to the OKH planners who authorized that a prototype be finished by April 1944. The Jagdpanther mounted a powerful 8.8cm Pak L/71 cannon within a fixed turret, which was situated atop a standard Panther V chassis. Although production of the tank was begun at MIAG in January 1944, it took another ten months before the larger NMH plant could expand the production run in time for the Wacht am Rhein ("Watch on the Rhine") winter counteroffensive. The Jagdpanzer IV L/70 (A) Zwischenlosung was the last tank to enter service with the Wehrmacht in September 1944. Essentially, German tank designers placed a Jagdpanzer IV turret on a Panzer IV chassis then fitted it with a powerful 75mm L/70(A) gun. The Zwischenlosung proved to be an excellent tank killer even though only 278 vehicles were built by war's end. The M4 Sherman medium tank was regarded by many as the workhorse of the US Army during World War II. In fact, virtually all of the Allied armies employed the Sherman in their armed forces, including the British, who developed an upgunned variant called the "Firefly". The Sonderkraftfahrzeug (Sd. Kfz.) 251 half-track had its origins in the same requirement as the smaller and lighter Sd. Kfz. 250. Intended as an armored personnel carrier, the Sd. Kfz. 251 entered service in 1939, and quickly became the standard means of transport for the panzergrenadiers. Nicknamed the 'Priest' by British crews because of its pulpit-shaped machine-gun turret at the front, the M7 grew from US experience with howitzers mounted on half-tracked vehicles. The War Department soon realized that a fully tracked carriage was required, and the M3 tank was modified to fill the role. Our Price: $17.99 Sold Out! The M5 Stuart light tank made its debut in the invasion of Casablanca in French North Africa. By 1943, and at the time of the invasion of Sicily, the upgraded M5A1 was becoming the standard light tank of the American armored divisions. In 1937, in an effort to reintroduce an economy engine, Ford offered a downsized Flathead V8, down to 136 cubic inches from the standard 221 cubic inches, as an option. Dodge was the sole provider of 1/2-ton trucks for the US Army during WWII, producing some 14,000 vehicles by war's end. Dodge altered the basic commercial chassis for military use, giving it, among other things, four-wheel drive. The Cromwell tank was used by the British Army during the later stages of World War II. The Cromwell was ordered in 1941 and intended to replace the lightweight Crusader "cruiser" tank by being more heavily armoured, and, it was hoped, more survivable in battle. Just one month prior to the commencement of "Operation Typhoon" (the German assault on Moscow) the Waffenamt was scheduled to begin installing the long-barreled 7.5cm KwK gun on its new Mark IV Ausf G tanks. Developed by the Quartermaster Corps, the jeep and other motor transport vehicles were transferred to the Ordnance Department in August, 1942. Despite its lightweight, the jeep could perform a variety of functions, including towing a 37mm antitank gun over a 7% grade. In January 1943, a new Tiger tank was ordered by the Waffenamt, this time with a turret large enough to mount the fearsome 8.8cm L/71 gun. Besides improving its tank killing capabilities, the new Tiger was also intended to be more survivable on the battlefield. The M4 Sherman "Dozer" tank was first used in Italy in 1943 and used in many locations afterwards. One of the more critical times where the modified dozer blade came in handy was shortly after the D-day invasion as the allied forces pressed the attack against the Germans nesting in the Bocage. The Sd.Kfz. 10 (Sonderkraftfahrzeug - special motorized vehicle) was a German half-track that saw very widespread use in World War II. Its main role was as a prime mover for small towed guns such as the 2 cm FlaK 30, the 7.5 cm leIG, or the 3.7 cm PaK 36 anti-tank gun. 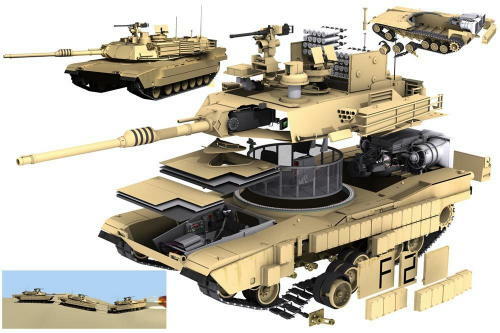 It could carry eight troops in addition to towing a gun or trailer. First deployed during the end of WWII and then again in the Korean War, the Maxom quadruple .50 caliber AA machine gun mount was called "Meat Chopper" because of its impressive firepower when used against human wave attacks. As early as 1934/35, General Heinz Guderian envisioned two basic types of armor to act as the lead elements of the future German Panzer Divisions. The first vehicle was to be armed with an anti-tank gun and two machine guns while the second one was to be a support vehicle, armed with a larger caliber gun. The Bedford QLT lorry was the most common British-made 4x4 truck produced, with over 52,000 supplied to the British Forces between 1941 and 1945. Many of these later continued in service with the British Army in Cyprus, Korea and Malaya. Our Price: $19.99 Back Order!